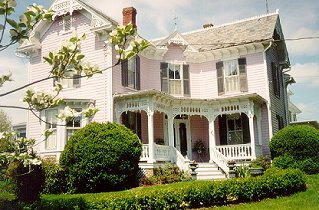 Welcome to the Shenandoah Valley's 102 year old Victorian bed and breakfast inn. The decor includes American antiques and Oriental rugs with all the modern comforts including private baths, cable TVs, and air-conditioning and ceiling fans for warm weather and fluffy down comforters and a room with a fireplace for cool weather. A full Southern country breakfast is served every morning, which might include pumpkin pancakes, country ham biscuits, a fresh omlette with eggs direct from the inn's own chickens, and Grand Marnier french toast! There's a jogging track available at the local park, a porch for rocking, a terrace for sunning and reading, and a hammock for snoozing. Be sure not to miss the inn's extensive gardens, including the formal herb garden. The inn is close to many great restaurants, hiking on the Skyline Drive, antique shops, James Madison University Bridgewater College, Mary Baldwin College, Eastern Mennonite University, Blue Ridge Community College, and the Shenandoah Valley Airport is 2 minutes away. This and other Weyers Cave Bed and Breakfast Inns can be found here in The Register.